Gerald R. Ford’s legacy should consist of more than simply playing football at Michigan, nailing a spectator with a golf ball, and becoming the only unelected VP and/or President. 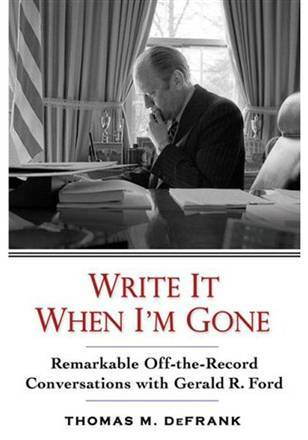 Write It When I’m Gone is an entertaining & insightful read from DeFrank’s 30+ years trailing Ford as VP and President. The majority of the content is derived from off-the-record conversations between Ford and DeFrank, hence the title/caveat from Ford – just write it when I’m gone. Gerald R. Ford could be called a lot of things. Having recently read Master of the Senate, Ford could be the Anti-LBJ. Ford was caring, considerate and candid. Ford asked junior reporters about their kids. LBJ was a bully. He was over-bearing, brutish, and belligerent. LBJ didn’t ask about his own kids. Ford could be the Anti-Reagan. Ford worked and traveled relentlessly, yet never became an eloquent speaker on the stump. Reagan routinely put in 35 hours a week while POTUS, but had a gift connecting and leading through his oratory skills. Would Reagan (would anyone?) open a State of the Union address like this? I must say to you that the state of the Union is not good…. Millions of Americans are out of work. Recession and inflation are eroding the money of millions more. Prices are too high, and sales are too slow. This year’s federal deficit will be about $30 billion; next year’s probably $45 billion. The national debt will rise to over $500 billion. Our plant capacity and productivity are not increasing fast enough. We depend on others for essential energy. Some people question their government’s ability to make hard decisions and stick with them; they expect Washington politics as usual. Tough to get re-elected with that… candor. His silver tongue aside, Ford lost his re-election campaign to Carter in 1976 because of the Nixon pardon. Following Watergate, Americans were out for blood. Nixon was a crook, of sorts. As the President’s Men details spilled out, Ford took the helm and promptly cleared Nixon of any wrong-doing. This didn’t sit well with America at the time. Ford knew what America needed was to heal. 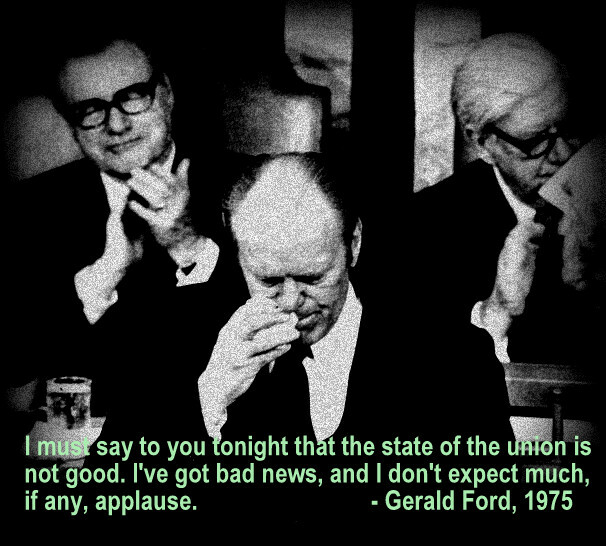 Decades later, Ford’s wisdom regarding the Nixon pardon is evident. The content on the development of Ford, Inc. was fascinating. Ford was the first former President to truly capitalize on his time in the White House for financial gain as a private citizen. Future ex-Presidents have followed his lead, most notably Bill Clinton. 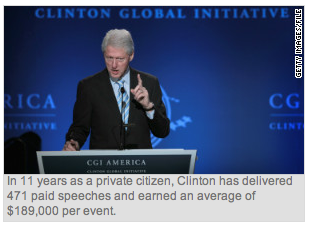 In July of 2012, CNN reported Clinton had given 471 paid speeches since leaving Pennsylvania Ave. Revenue from those speeches? $89M. Ford’s classic line, which underscores his self-deprecating manner, was this: “I’m a Ford, not a Lincoln.” He seemed like a great guy. I would have enjoyed seeing what another 4 years in office would have done for our country – and his legacy. Bottom Line: Entertaining read with an unusual amount of candid thoughts from a former President. Bradley Hartmann is El Presidente at Red Angle (www.redanglespanish.com). He’s reading 52 books this year – or at least he’s trying. 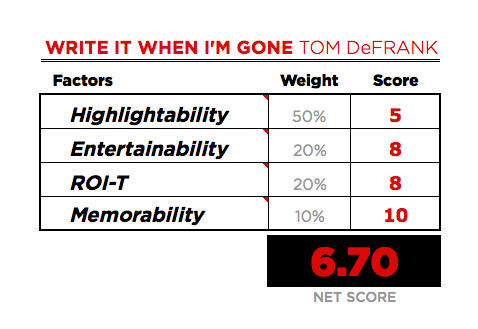 So far… ahead of schedule. ‹ What’s your Moon Shot?